Two friends and I spent the last two weeks traveling across North and East Texas collecting patterns, kits, and license plates in the Row by Row Experience shop hop. For the first time, I completed a quilt using the patterns and turned it in at "Not Your Mama's Quilt Store" in Plano. For being the first person to turn in a finished quilt at this location, I received 25 fat quarters and a jelly roll of my choice. We are planning to make a road trip later to collect more patterns. I have enough kits to make at least two more quilts. I am trying to make a theme out of them. There are several kits that have windmill appliques. I love windmills. One will have ducks and umbrellas. This is "In A Pickle". 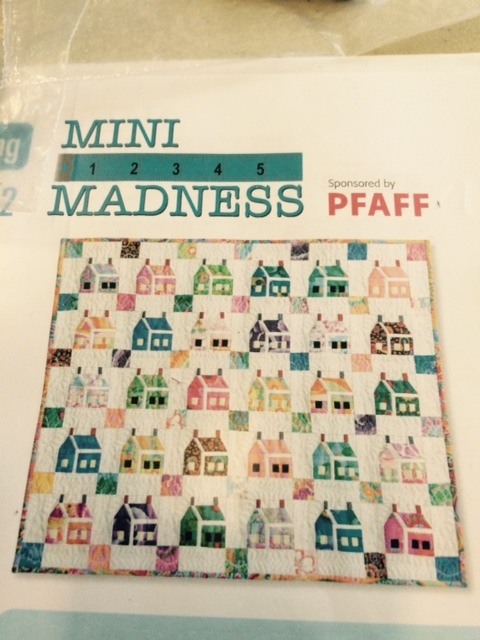 I purchased it as a kit, four years ago at the Plano Quilt Show. 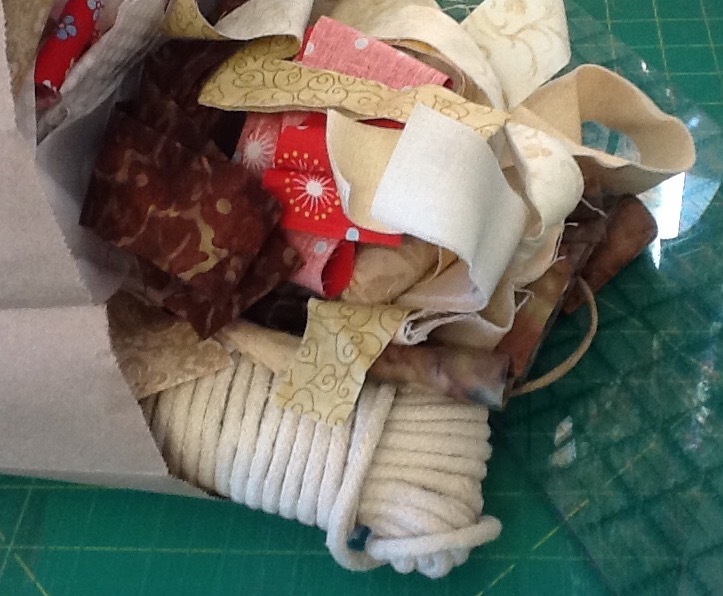 I worked on the paper piecing only on retreats and then assembled it at home. The top is now sewn together, sandwiched, pinned, and ready to quilt. I am going to stitch in the ditch along the flying geese. The open areas will be done in my jumbo hoop on my Bernina 830. I have yet to design the quilting embroidery file. Just as a side note - the Plano quilt show is August 14-15. Hope to see many of my friends there. This is my Lone Star quilt just waiting to be quilted. I have no plans for it so I'm not in any hurry. Binding is made. 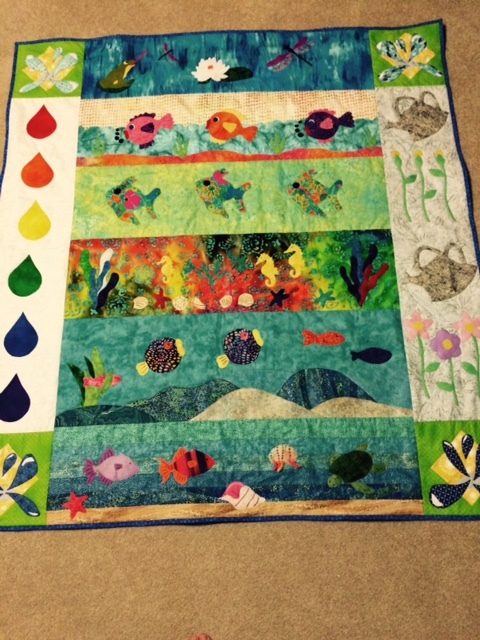 I am a member of two small quilting groups. One group decided to have a block exchange. This is the results of our first exchange. Mine is the hexagon flower garden block. We all used the same background fabric. The rules are: use only blue fabric and blocks finish to 9 inches. Our second exchange is coming up next month. Spoiler alert: this is my next block. Can't wait to see all of the other blocks. We will have a third exchange by the end of the year and that will give us enough blocks to complete a quilt. This is a pattern I purchased last year on the Row by Row shop hop. I have all of the yo-yos finished but that's it. I did pick up all the trims I needed for it while on this years shop hop. This is the mini quilt paper piece pattern I started. I will probably work on it at our next retreat in September. It is really turning out super cute. http://www.critterstitch.com/sites/default/files/Mystery Quilt_0.JPG" align="" /> This is the mystery quilt I started last December at a class with Bonnie Hunter. And in keeping with Bonnie Hunter, I started her Leader and Ender Challenge this July - Tumblers. I purchased a Accuquilt die for a 4 inch tumbler. I have a bunch cut and have started assembling pairs. This will use up a bunch of my scrap fabric and will probably end up as quilts for Project Linus. Do you see the pile of scraps at the top of the die picture? That are the scraps I have left over from cutting the tumblers. What to do with those? Bonnie speaks to my wanting to use up my scraps. I am hoping the make a clothesline rug from them. When I spoke to a friend about my plans, she said she had tried to make one and gave up. We will see. Isn't this finished one pretty? 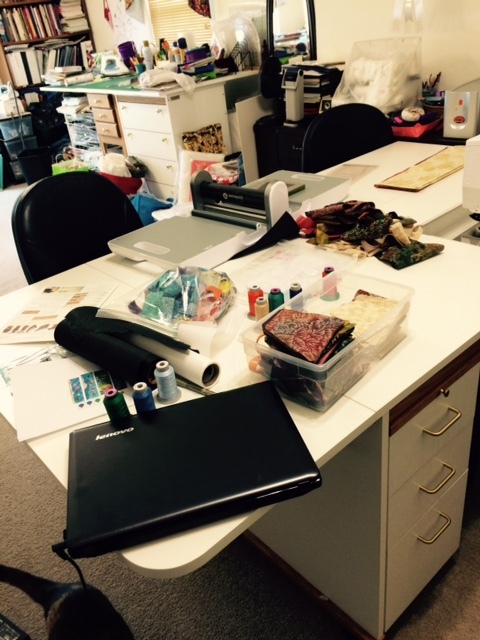 When I get this many projects going at the same time, my sewing studio becomes a mess and I get overwhelmed. I have to clean things up or I can't function. And finally, Baltimore Spring. We mainly do handwork at the two home groups I am a member of. 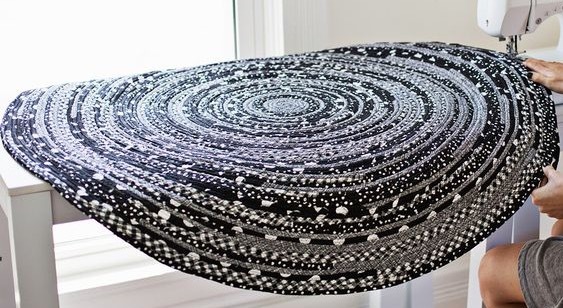 I have wanted to make this quilt for a long time and finally pulled the trigger and purchased the pattern. I realize this is a long term project but I am so in love with it and applique in general. We found this pattern at one of the quilt stores made from rayon batik fabric. It was really nice. These are the two fabrics I purchased to make it from. I plan to make one out of scrap fabric to make sure it fits before I cut my good fabric. I expect to need darts added. The pattern has three sleeve options and two necklines. And lastly, a mention of my yard. 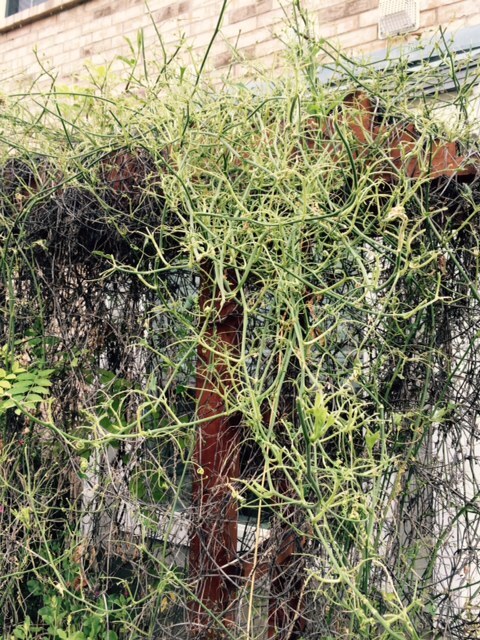 Every year my passion vine overgrows the trellis. Butterflies come and lay eggs. The eggs hatch and caterpillars eat the leaves, form cocoons and the process starts over. Normally my passion vine keeps up the pace with the infestation and still blooms to all glory. This has been a strange year will all the rain and lack of sun in the spring. Look at the comparison of previous years and this year. The caterpillars have eaten all the leaves and there are no flowers. Since there are no leaves, the Cardinals can see the caterpillars and feast there regularly. Next year will probably be normal again. Small price for butterflies fluttering around your house.